Our students were asked merely to create a piece that mapped some sort of personal information. 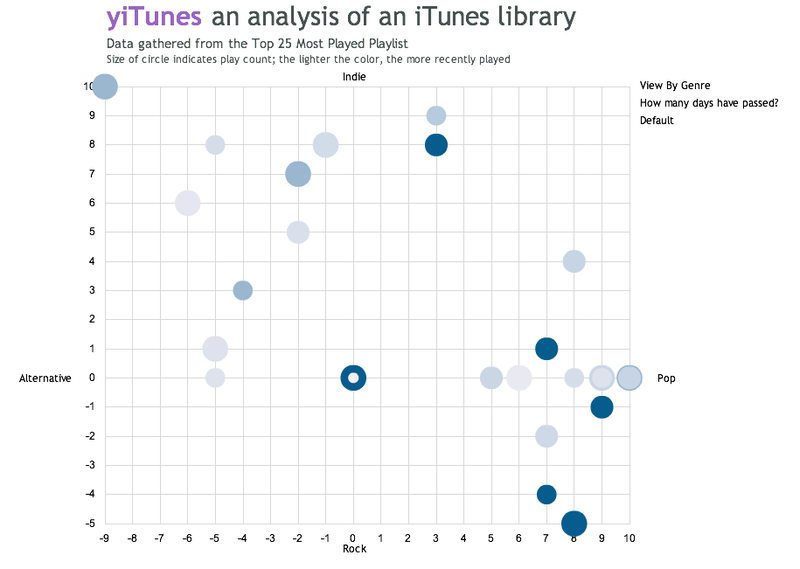 Some took it more literally than others and created a geographical map, while others mapped things as diverse as subcultures or their music libraries. A narrative animation of my daily life at Penn. My aim was to explore the relationship between photographic and abstract representations of reality and also between discrete and continuous experiences of time. An examination of personal cellular phone contacts, displaying movement from contacts’ base area code to present day location. A visualization examining the distance traveled, price, quantity and nutritional breakdown of the ingredients in my Oat Everything Cookies to determine and compare the value of the resources expended to bring them all from the world to my kitchen to your mouth. This is a mapping study of my experience of coffee consumption during the past 27 days: Feb. 4th to March 2nd, 2009. I have kept a record of the places that I have frequented and the amount of money I spent at those places to observe the expense to my wallet: $109.46. Hence the name. Mapping electronic correspondence over a Monday, Tuesday, and Wednesday of a typical week in the life of an engineering student. Data source: Gmail inbox. Locations plotted based on IP addresses logged in e-mails. A chronicle of my first experience with roller coasters. Abstract aerial view maps my journey in space and time, while ground view draws comparisons among the different coasters. An analysis of subcultures and their various defining characteristics, displayed in map form. Similar subcultures are grouped closer together. A narrative of a fateful trip taken to an uninhabited island off of the coast of Georgia, documented through maps and photos. An interactive tool that helps you stalk me. 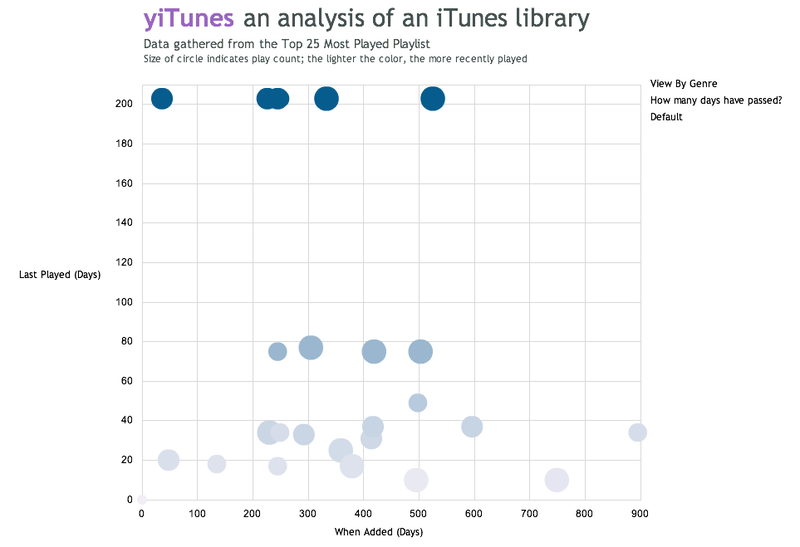 A graphical display of the Top 25 Playlist in iTunes. 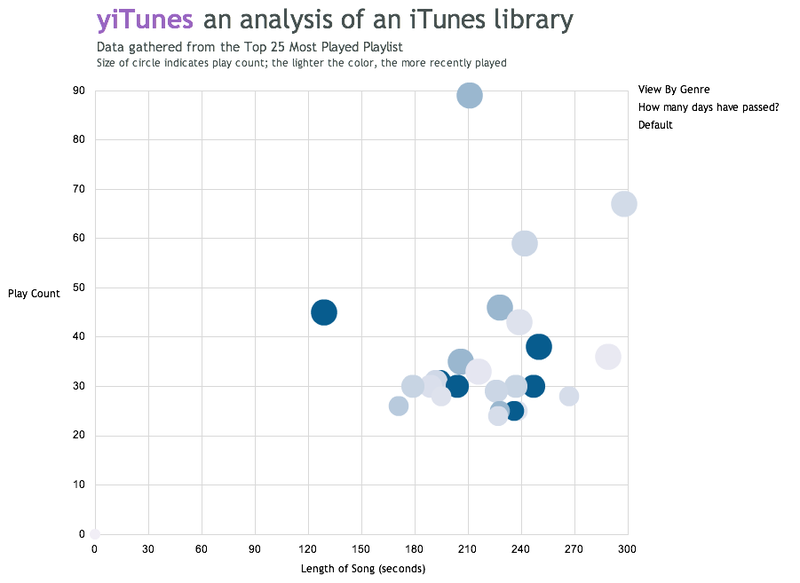 Color of dots indicate last played and size of dots indicates play count. A multi-media extravaganza – on ice! Note: All the work on this page is the property of the designer and may not be used in any way without permission and proper attribution.